Rockers can be tough to shop for .... or easy. It all depends on your perspective. 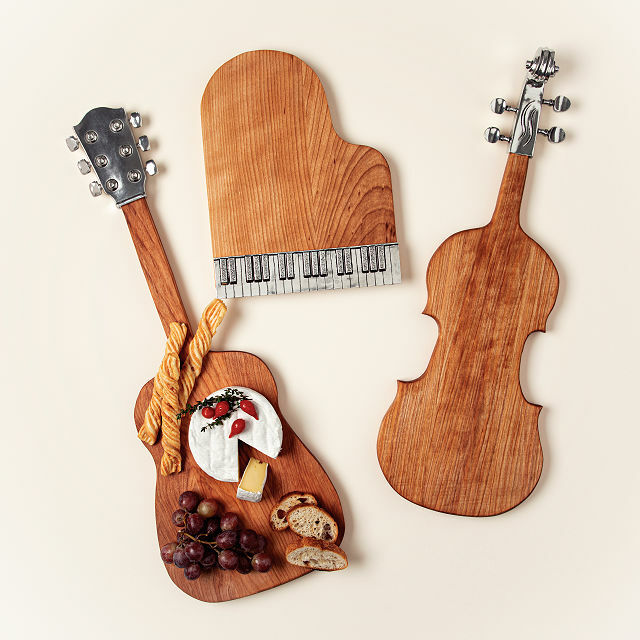 Pluck, play, or strum up a little visual interest at your next rager (or cocktail party at a sensible hour) with this rockstar-approved serving board. Each is handcrafted from Nova Scotian yellow birch and accented with pewter details. We wouldn't blame you for keeping the spotlight-ready piece for yourself—but it also hits the right note with music teachers, songstress friends, and unique home decor enthusiasts. Handmade by Bonnie and John Caraberis in Canada. Hmm... Might be more of a female gift than a male, but you never know. People that love art would probably be into this. Now that I think about this, people that love dried sausage and provolone would probably as well.